The Sixties saw some of the most successful British television shows of all time These were shows that weren't just popular in the United Kingdom but also found success internationally and even in the highly competitive market in the United States. Among the most successful of the British shows of the Sixties was one centred on a literary character who had been around for over thirty years at the time. Simon Templar, also known as The Saint, was a con man and thief who only robbed from those who he felt truly deserved it: criminals, crooked politicians, corrupt businessmen, and so on. The Saint proved extremely popular, so much so that Leslie Charteris would not only write a number of books and short stories about the character, but the character would find success in many other media as well. For those unfamiliar with The Saint, he was Simon Templar, which may or may not be his given name. It is never revealed why he was given the nickname The Saint, but it is known that he was given the nickname when he was only nineteen. As a thief and a con man, Simon Templar occasionally uses aliases, all of which use the initials S.T. (Sullivan Titwillow, Sebastian Toombs, Sugarman Treacle, and so on). He also leaves a calling card wherever he has struck, bearing a stick figure with a halo. It is generally assumed that Simon Templar is British (his home is in London, after all), although he obviously spent a good deal of time in the United States given the number of his American friends and acquaintances. As to Simon Templar's modus operandi, he is essentially a modern day Robin Hood. He makes his living fleecing and stealing from those whom he calls "ungodly". When The Saint managed to extract a substantial amount from one of the ungodly, he would keep only a "ten percent collection fee" and either returned the money to its rightful owners or donated it to charity or did something else with it entirely. The success of The Saint books and short stories would quite naturally lead to the character being adapted in other media. The Saint in New York (1938), starring Louis Hayward as Simon Templar, was based on the novel of the same name. It was successful enough that RKO made seven more Saint movies, the first five starring George Sanders and the last two starring Hugh Sinclair. Louis Hayward, who was unable to star in the RKO series, returned to the role of Simon Templar in The Saint's Return in 1953. The Saint would also see success on radio. Radio Éireann's Radio Athlone aired a Saint radio show in 1940. In 1945 both NBC and CBS would air their own radio shows based on The Saint. The most successful radio incarnation of The Saint would debut in 1947 and initially starred Vincent Price in the title role. Barry Sullivan also filled in a few times when Mr. Price was not available. This version would run on and off until 1951 on CBS, Mutual, and NBC. Eventually Tom Conway would take over the role of Simon Templar. There would also be a fairly successful Saint newspaper comic strip that ran from 1947 to 1961, as well various Saint comic books. Given the success of The Saint in several different media, it was perhaps inevitable that there would be a television adaption. In fact, in the Fifties Leslie Charteris would be approached more than once for the television rights to Simon Templar. The first occurred in 1951, when advertising firm Stockton, West, Burkhart, Inc. sought the rights to Saint short stories to be used on a proposed show Mystery Writer's Playhouse. Richard M. Dunn of Stockton, West, Burkhart, Inc. was the man sent to convince Leslie Charteris into letting them have the television rights to various short stories, but Mr. Dunn never made a definite offer and so Mr. Charteris never committed. It was the following year that Richard M. Dunn sought to adapt The Saint as its own television show. Nothing came of this either. Over the years Leslie Charteris would be approached by others who wanted to make a TV show based on The Saint. In fact, in 1961 there would be two attempts at getting the television rights to The Saint alone. That year Harry Alan Towers, the producer now best known for his series of Fu Manchu movies starring Sir Christopher Lee, sought the rights to make a television series. Mr. Towers would not be successful. Others would be in getting a TV series based on The Saint on the air, namely producers Robert S. Baker and Monty Berman. In 1948 Robert S. Baker and Monty Berman founded Tempean Films, a company that produced B-movies from comedies to horror movies. It was in 1961 that the two men founded a television production company, New World Productions. Fortunately for Messrs. Baker and Berman, they had an advantage over Harry Alan Towers in getting the television rights for The Saint. Quite simply, they were acquainted with director John Paddy Carstairs, who had directed the 1939 film The Saint in London and, more importantly, also happened to be friends with Lesile Charteris. John Paddy Carstairs arranged a lunch where the two producers could meet Leslie Charteris. Robert S. Baker and Monty Berman were able to convince the creator of The Saint to give them a three month option for a TV series. They offered the proposed TV series The Saint to Associated-Rediffusion (the ITV franchise that provided weekday programming for London), who turned it down due to the proposed series' projected budget of £15,000 per episode. Robert S. Baker and Monty Berman then went to Lord Lew Grade of ITC, who bought the proposed series. It was then that they bought the television rights to The Saint from Leslie Charteris, with the condition that Mr. Charteris would have input on the show's scripts. As to casting Simon Templar, it might be surprising to many that Sir Roger Moore was not the producers' first choice. The first actor they talked to was Patrick McGoohan, who had just finished the first series of the very popular show Danger Man. It soon became obvious that Mr. McGoohan was not suited to the role. Quite simply, he objected to the character becoming involved with women, and also lacked the tongue in cheek sort of humour necessary for the show. Of course, in the end it would be Sir Roger Moore who would be cast as Simon Templar on the TV series. Sir Roger Moore already had a impressive résumé on both sides of the Pond. He had starred in the British swashbuckler TV show Ivanhoe, which aired on both sides of the Atlantic. 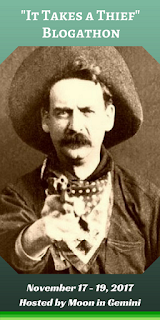 He had also appeared in the short-lived American TV series The Alaskans and played cousin Beau Maverick on the highly successful Western Maverick. Having starred on Maverick, Sir Roger Moore had already proven that he had the necessary tongue-in-cheek sense of humour. What is more, he was already a fan of The Saint. He had earlier tried to get the television rights to The Saint on his own. The Saint debuted on September 30 1962 in ITV regions except the Midlands and Northern in the United Kingdom. It proved very successful, so much so that it was second in popularity among male viewers only to wrestling. Lord Lew Grade tried to sell The Saint to the American broadcast networks, only to be rebuffed by all three of them. Indeed, Mort Werner, then senior vice president for programming at NBC, commented after viewing two episodes of the show, "I have never seen so much crap in my life." Fortunately events would unfold that would convince NBC to eventually change their minds about The Saint. The American broadcast networks' rejection of The Saint would not keep the show off American television screens. Lord Lew Grade simply entered The Saint into syndication in the United States in 1963. It soon became the most popular TV show syndicated in the United States at the time. Perhaps amusingly, among the stations that picked up The Saint in syndication was NBC's flagship station, WNBC in New York City. WNBC aired The Saint at 11:15 PM on Sunday night following their nightly news. In that time slot The Saint proved phenomenally successful. The show would also prove successful on NBC's stations in Chicago and Los Angeles. What is more, the success of The Saint was not isolated to NBC owned and operated stations. The show was so successful on television stations throughout the U.S. that it would prove to be one of the most successful syndicated television shows of all time in the United States. It was in 1965 that the TV show The Saint very nearly came to an end. After 71 episodes, nearly every one of Leslie Charteris's short stories had been adapted. What is more, Robert S. Baker and Monty Berman's contract with Leslie Charteris was set to expire. Fortunately, The Saint would continue. Producer Robert S. Baker and star Roger Moore then formed a new company, Bamore, to produce a new series of The Saint in colour. As to Monty Berman, Mr. Baker's partner on the first 71 episodes of The Saint, he went on to produce the short lived TV series The Baron. It would be the show's move to colour, and probably its phenomenal success in syndication, that would finally interest NBC in the show. After having turned down the show rather harshly years earlier, NBC bought the first colour series of The Saint. The Saint debuted on NBC on May 21 1967. It went off the network in September 1967, only to return in February 1968 as a mid-season replacement. The Saint would leave NBC again in September 1968. It returned for one last time as a summer replacement in April 1969. In all NBC broadcast 32 of the 47 colour episodes of The Saint. The colour episodes were aired on ITV in the United Kingdom in black and white, as ITV would not made the transition to colour until late 1969. It was in 1969, after 118 episodes of The Saint, that Roger Moore decided it was time to stop playing Simon Templar. The final episode of The Saint aired in the United Kingdom on ITV on February 9 1969. The Saint ended its run on NBC on September 12 1969. Reruns of The Saint have persisted in syndication in the United States ever since. Simon Templar would not remain absent from television screens for long, although in his next TV incarnation he would not be played by Roger Moore. Return of The Saint was originally supposed to be Son of The Saint, with the show following the adventures of Simon Templar's son. Eventually this idea was dropped in favour of the show being about Simon Templar himself, although updated to the Seventies. While the show included Robert S. Baker as its executive producer, as well as Lord Lew Grade as producers, there was absolutely no continuity between it and the Saint series of the Sixties. Return of The Saint debuted on ITV on September 10 1978 and ran until March 11 1979 for 24 episodes. Return of The Saint would be rerun in the Untied States as part of The CBS Late Movie. While it only lasted one series, Return of The Saint did revive interest in the Sixties version starring Sir Roger Moore. Since then there have been three more attempts at a Saint TV series. In 1987 a pilot entitled The Saint in Manhattan, starring Andrew Clarke, was produced. Although it did not sell, it did air as part of CBS Summer Playhouse, an anthology series consisting of failed pilots. From 1989 to 1991 London Weekend Television aired six Saint television movies starring Simon Dutton as Simon Templar. The movies were The Saint: Fear in Fun Park, The Saint: The Big Bang, The Saint: The Software Murders, The Saint: The Brazilian Connection, The Saint: Wrong Number, and The Saint: The Blue Dulac. More recently, a failed pilot for a new series based on The Saint was made, starring Adam Rayner as Simon Templar. In many episodes of the Sixties TV show The Saint starring Sir Roger Moore, Simon Templar differed only a little from many private eyes on other shows. That having been said, there were plenty of episodes in which he acted as the thief and con artist that only robbed the ungodly he had been in the earliest books and short stories. Perhaps the most notable instance of Simon Templar running a con game on the ungodly is one he ran on other con artists in the episode "The Bunco Artists". A husband and wife team of con artists con a church in a small English village out of money the church had saved for its restoration. Fortunately, the vicar's daughter happens to be friends with Simon Templar and alerts him to the two suspicious characters. The Saint then creates his own con game in order to get the church's money back from the con artists. Of course, Simon Templar ran cons on more than just con artists. In "The Element of Doubt" Simon Templar matches wits with a corrupt defence attorney who does not mind that his clients are guilty and will do anything to get a verdict of "not guilty" for them. Simon Templar then runs a con on the attorney's current client that certainly won't go well for the attorney. In "The Man Who Was Lucky", The Saint's target was a protection racket. While Simon Templar uses various confidence tricks throughout the series, he also sometimes resorts to outright breaking and entering. In "The Counterfeit Countess', in which Templar takes on counterfeiters, he breaks into one of the counterfeiter's offices and then opens a safe to find some bogus money. 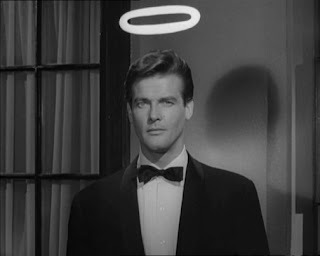 Simon Templar was already a very influential character before the TV series starring Sir Roger Moore debuted. Arguably his influence would only grow even more after the TV show. Arguably the influence of The Saint can be seen in every show that centres on individuals act as modern day Robin Hoods, using confidence games and sometime outright thievery to see that justice is served. In many ways such shows as Switch, Remington Steele, Hustle, and Leverage all owe something to Simon Templar. It is perhaps a mark of the show's success that after books, feature films, radio shows, a comic strip, comic books, and other television outings, that the Sixties version of The Saint not only remains in syndication, but remains the most familiar and popular incarnation of Simon Templar. With the recent release of director Kenneth Branagh's adaption of Agatha Christie's novel Murder on the Orient Express, a few venues have compiled their list of the greatest train movies ever made. I have found myself disagreeing with some of these lists, as they often include movies with a few scenes set on trains while excluding movies that are set almost entirely on trains. I then thought I would come up with my own list of the five greatest movies set on trains ever made. My criterion for choosing the films was very simple. A significant amount of the movie had to be set on a train. It is for this reason that such films as Some Like It Hot (1959) and North by Northwest (1959) did not make the list. While both number among my favourite movies of all time, the amount of time spent on a train in either of them is not significant enough. In fact, my favourite scenes from both movies take place away from trains! Without further ado, here are my top five best train movies. 1. 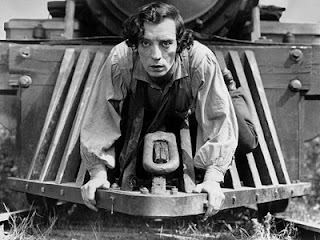 The General (1926): To give you an idea of just how much of a role trains play in Buster Keaton's classic The General, the movie takes its name from a locomotive--the Western & Atlantic Railroad train for which Johnnie Gray (played by Buster Keaton) is the engineer. When Union spies commandeer The General, Johnnie gives chase, using any means of transportation he can to get his train back. Although The General received poor reviews and did badly at the box office upon its initial release, it is now regarded as one of the greatest silent movies ever made. It has also proven very influential. Indeed, a very good argument can be made that The General was one of the earliest blockbuster, action comedies ever made. 2. The Lady Vanishes (1938): I have to admit that it was very hard for to decide whether The General or The Lady Vanishes would occupy the number one spot, as they both number among my favourite movies of all time. I ultimately decided upon The General as I think it was a bit more revolutionary for its time. Of course, I have to admit to some bias where The Lady Vanishes is concerned, as it was the first film in which I ever saw Margaret Lockwood, who numbers among my favourite actresses of all time. And Margaret is certainly fantastic here, playing socialite Iris Henderson. When an elderly, fellow Englishwoman disappears from a train going through Europe, it is up to Iris and musician Gilbert Redman (played by the great Sir Michael Redgrave) to find out what happened to her. Except for the first several minutes, The Lady Vanishes it is set almost entirely upon the train. The film also marks the first appearance of Charters and Caldicott (played by Naunton Wayne and Basil Radford), two Englishmen who are absolutely obsessed with cricket and would go onto appear in several more films over the years. The Lady Vanishes was directed by Alfred Hitchcock and remains one of his best films. 3. Twentieth Century (1934): Alongside the Orient Express, the 20th Century Limited is one of the most famous trains of all time. For those unfamiliar with it, the 20th Century Limited was a passenger train that ran on the New York Central Railroad from New York City to Chicago in the years between 1902 and 1967. 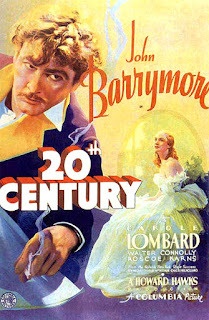 A good portion of Twentieth Century is set aboard the 20th Century Limited, which Broadway impresario Oscar Jaffe (played by John Barrymore) boards in disguise in order to escape his debtors. Unfortunately for Oscar, his former protegée Lily Garland (played by Carole Lombard) also boards the train. 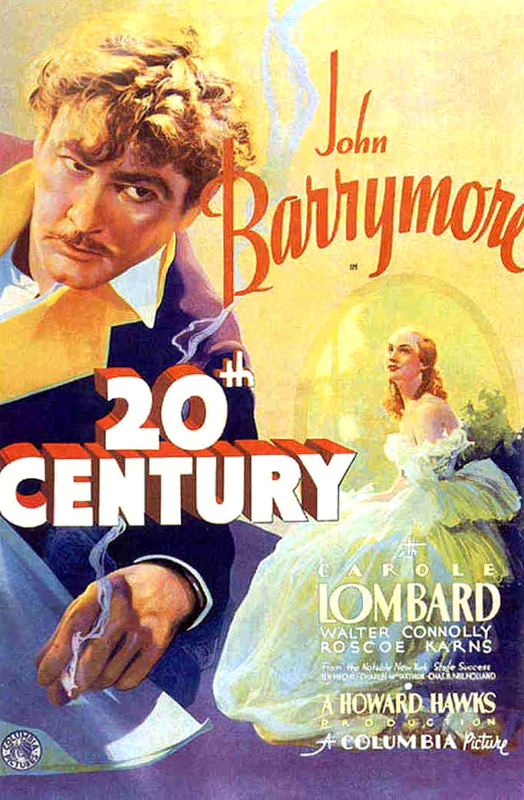 Twentieth Century is one of the best pre-Code comedies, featuring an excellent cast that includes Roscoe Karns, Charles Lane, and Edgar Kennedy. It also happens to be extremely funny. 4. The Train (1964): If there was a Golden Age for World War II movies, it was probably the Sixties. Among the very best of the movies about the Second World War released during the decade was John Frankenheimer's The Train. In The Train, art masterpieces stolen by the Nazis are being shipped by rail to Germany. After the Nazis remove works of art from the Jeu de Paume Museum, its curator turned to the French Resistance to somehow stop the train without damaging the precious works of art it carries. The movie was loosely based on an actual incident that occurred in August 1944 that was detailed in the 1961 book Le front de l'art by Rose Valland. Where the movie departed from history is that in reality the French Resistance managed to delay the train through paperwork, giving the Allies time to immediately seize the train when it was only a few miles away from Paris. While The Train may not be historically accurate, it is among the most exciting action movies to involve a train. 5. Night Train to Munich (1940): British star Margaret Lockwood had the rare, good fortune to star in two of the greatest movies involving trains ever made. In 1938 she appeared in Alfred Hitchcock's The Lady Vanishes (discussed above). In 1940 she appeared in Carol Reed's Night Train to Munich. The casting of Margaret Lockwood in Night Train to Munich would seem to be more than coincidence, as it seems likely 20th Century Fox hoped to repeat Gainsborough's success with The Lady Vanishes. Indeed, not only did Miss Lockwood appear in both films, but the screenplays for both films were written by Sidney Gilliat and Frank Launder and both feature the characters of Charters and Caldicott. Of course, both films involve trains. 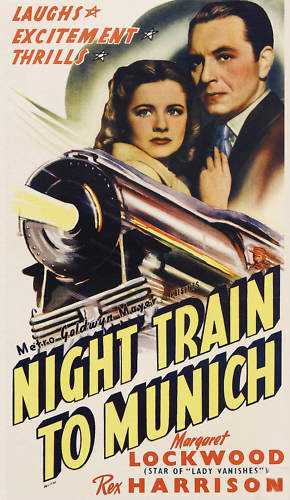 That having been said, Night Train to Munich was not a mere imitator of The Lady Vanishes, as in many ways it was a very different movie. In Night Train to Munich Margaret Lockwood plays the daughter of Czechoslovakian scientist who is developing a new type of armour plating. Arrested by the Nazis and sent to a concentration camp, she and another prisoner escape in an attempt to make their way to London and her father (who had escaped there). Night Train to Munich is filled with plenty of twists and turns, as well as some of Carol Reed's best direction. John Hillerman, who played radio show star Simon Brimmer on Ellery Queen and Jonathan Higgins on Magnum, P.I., as well as roles in such films as Chinatown (1974) and Blazing Saddles (1974), died on November 9 2017 at the age of 84. 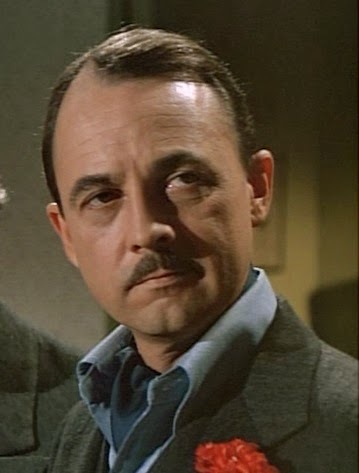 John Hillerman was born on December 20 1932 in Denison, Texas. He went to the University of Texas in Austin before serving in the Air Force for four years. It was while he was in the Air Force that he became interested in acting, auditioning for a production of Death of a Salesman while he was stationed in Fort Worth. While in the Air Force he appeared in around two dozen plays. After his service, Mr. Hillerman moved to New York City where he studied acting at the American Theatre Wing. Mr. Hillerman made his debut on Broadway in a revival of The Great God Brown in 1959. In 1960 he appeared on Broadway in Henry IV, Part II. In 1963 on Broadway he appeared in The Lady of the Camellias. He ultimately worked on stage for literally years in both New York City and Washington D.C. After years of appearing on stage he found himself with only $700 in his bank account. He then moved to Los Angeles to pursue a more lucrative career in film and television. John Hillerman made his film debut in 1970 in a bit part as a reporter in They Call Me Mister Tibbs!. The following year he had a slightly more substantial role in the Western Lawman (1971). Mr. Hillerman would play ice cream parlour operator Howard Johnson in Blazing Saddles (1974) and the crooked deputy chief of the water department in Chinatown (1974). In the Seventies he also appeared in such films as The Last Picture Show (1971), Honky (1971), What's Up, Doc? (1972), The Carey Treatment (1972), Skyjacked (1972), The Thief Who Came to Dinner (1973), High Plains Drifter (1973), Paper Moon (1973), The Day of the Locust (1975), Lucky Lady (1975), Audrey Rose (1977), and Sunburn (1979). While he appeared frequently in feature films, John Hillerman would have a more significant career in television. He played Simon Brimmer, the radio detective who matches wits with Ellery from time to time on the cult TV series Ellery Queen. He was also a regular on The Betty White Show, playing Betty's ex-husband and director of the fictional television show Undercover Woman, John Elliott. He played Mr. Connors, Ann Romano's boss, on One Day at a Time. He guest starred on such shows as The Sixth Sense, The F.B.I., Maude, Kojak, Mannix, Wonder Woman, Hawaii Five-O, Little House on the Prairie, Hart to Hart, and Lou Grant. It was in 1982 that John Hillerman began playing the role of Jonathan Quayle Higgins III, VC on the hit series Magnum P.I. He played Sir Francis Commarty in the mini-series Around the World in 80 Days. He also had a regular role on The Hogan Family starting in its final season. He guest starred on the show Tales of the Gold Monkey; Simon & Simon (on which he played Higgins); The Love Boat, and Murder, She Wrote (on which he appeared as Higgins). He appeared in the films History of the World: Part I (1981), Up the Creek (1984), and Gummibärchen küßt man nich (1989). In the Nineties John Hillerman appeared in the mini-series Berlin Break and the feature film A Very Brady Sequel (1996). Afterwards he retired from acting. When it came to erudite, but arrogant characters, no one was better than John Hillerman. Many will remember him as Simon Brimmer on Ellery Queen, the self-important radio detective and friendly rival to Ellery. Many more might remember him as Higgins on Magnum P.I., who was essentially Magnum's pompous and elitist foil on the show. While John Hillerman's two best known characters were fairly similar (enough that it is often said that Jonathan Higgins was based on Simon Brimmer), he did play other sorts of roles. In Paper Moon Mr. Hillerman played two roles as far from Brimmer and Higgns as one can get, bootlegger Jess Hardin and his corrupt brother Deputy Hardin. Yelburton in Chinatown also had little in common with John Hllerman's best known characters. While John Hillerman was very good at playing upper class, erudite, and arrogant characters, he did equally well in a number of other roles as well.